There were two Training (Day-long) for four days, title “Business Social Initiative (BSCI)” held on 25 February, 2017 (1 day training) and title “Social Compliance” held on 26-28 February, 2017 (3 days training). 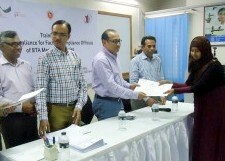 Those Training were organized by GIZ in Cooperation with BTA at Bangladesh Institute of management (BIM). Hon’ble Chairman of BTA Mr. Md Shaheen Ahamed was attend on the final and last Day of Training on 28 February, as the Chief guest for issue and distribute the Certificates to the trainees. Mr. Md. 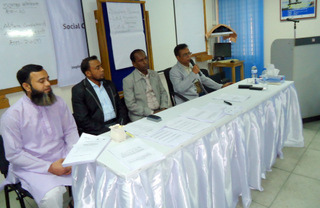 Aminul Hasan (Helal), Senior Social Compliance Advisor of GIZ was attend there as special guest. The Secretary Mr. Mohammad Nurul Islam of Bangladesh Tanners Association (BTA) was attend there on 25 February (first Day) as the Chief Guest for opening the Training season. A team of four (4) Executive Committee Member headed by the Treasurer Mr Md Mizanur Rahman from Bangladesh Tanners Association (BTA) visited the Training.